The atrium of the agriculture building was a-buzz last Friday, Feb. 5, as a student-organized farmers’ market offered fresh, local food and handcrafts to the campus community. Local growers and businesses, such as Good Spirit Bakery, Simpkins Farms and Uncle Mike's Natural Products, among others, were on hand for the university's first farmers' market, which students in pharmacy and nutrition hope will not be the last. 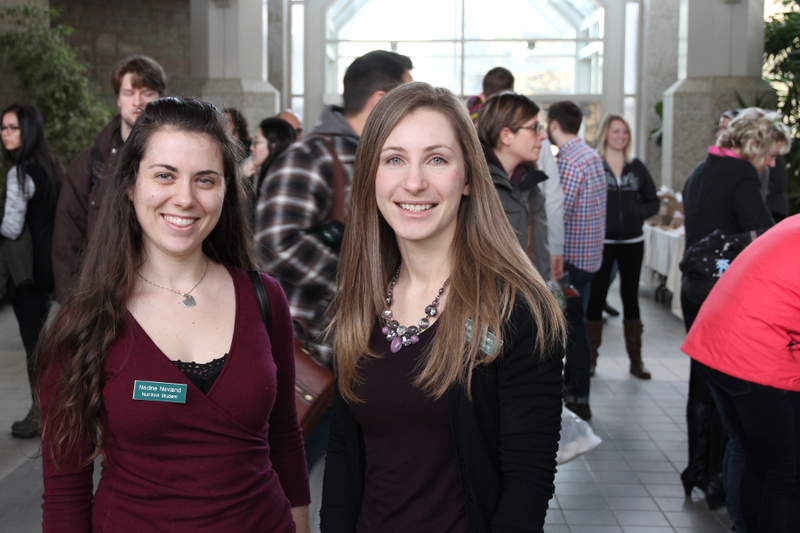 The market, a pilot project to determine if the university can sustain a similar market on campus more regularly, is also the senior project of Kara Friesen and Nadine Nevland, both third-year students in the College of Pharmacy and Nutrition. They partnered with the Office of Sustainability to help get the event off the ground. The duo initially encountered a few logistical challenges in trying to co-ordinate the market. However, it all worked out for them. "It was a challenge to figure out who to talk to and (how) to get vendors" said Nevland. But, luck prevailed, and they ended up getting in touch with one of the organizers of the Saskatoon farmers' market, who gave them contacts for several vendors who jumped at the opportunity to come to campus for the day. "Lots of people wanted it to happen," said Friesen. "Even though it was kind of pushed to the end—we only got vendors after Christmas, and the location we only confirmed a few weeks ago—everyone was so helpful." Among those who came through was the U of S Horticulture Club, "who started growing microgreens for the market as soon as they could," said Friesen. "It felt like as soon as we asked the right people, and found the space for them, it happened," she added. In turn, the campus community came out in spades to support the market, with many of the vendors running out of products early and having to leave or get more. With the event over, Friesen and Nevland will now conduct a feasibility report to see if this type of market is sustainable on campus. The project, as part of the Living Lab program in the Office of Sustainability, supported by Fisher Scientific.